A 09 yo male complaining of generalized tonic-clonic seizures since 2years. General examination revealed multiple cafe-au-lait spots and axillary freckling. 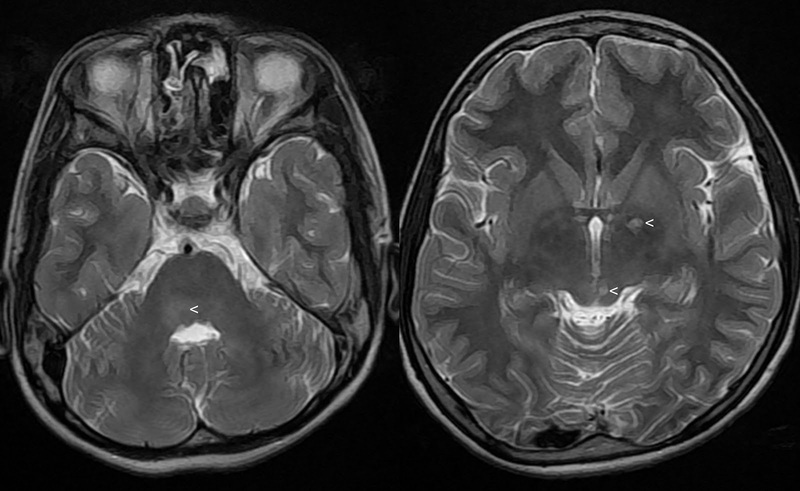 MRI brain shows faint T2 hyper intensities in left basal ganglion, tectum of mid brain and right half of Pons non enhancing on post contrast, suggestive of unidentified bright objects (UBO) of NF1. UBOs are 'T2 hyper intense foci' or focal areas of high signal intensity (FASI), seen in 60-80 percent of patients with Neurofibromatosis Type I (NF1). These lesions typically appear around 3 yr, increase in number and size until 10-12 yr, and then decrease or even disappear. Common locations include basal ganglia, thalami, dentate nucleus of cerebellum and brainstem. Pathologically, these lesions correspond to vacuolar changes in the myelin sheath. 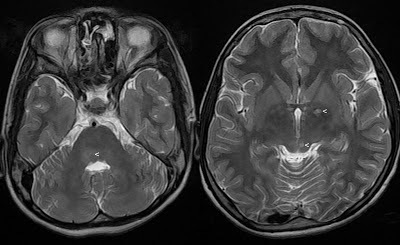 Even though these lesions generally do not cause neurological symptoms they have been correlated with learning disabilities. A study conducted on 100 has revealed a strong relationship between cognitive and behavioural problems with these focal areas of high signal intensity (FASI or UBO) in children with NF1. The long term effects of these hyper intensities not yet documented. Department of Pediatrics, and Department of Radiology, University of Münster, Germany. Isn't UBO same as FASI ?